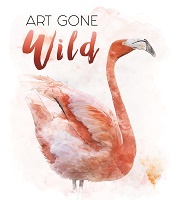 Celebrate the beauty of Kansas in the fall at Rolling Hills Zoo’s plein air event, Art Gone Wild. Immerse yourself in the artistic experience, all part of this year’s Art Gone Wild Plein Air Event. Regional plein air artists, along with the Zoo’s own animal artists, will be in the zoo showcasing their artistic talent. Plein air is a unique art form as artists create their works of art in the “open air” and take their inspiration from the beauty of nature. From an artist’s perspective, nature’s beauty is reflected in art, from the literal - through breathtaking landscapes, brilliant sunrises, cascading waterfalls, flowering foliage and amazing wildlife; to the abstract - inspiration provided by the textures, colors and sounds of the natural world. Rolling Hills Zoo’s animal artists create art as a form of animal enrichment. Enrichment enhances the animal’s quality of care and improves their physical and psychological health. Many of the Zoo’s animals paint on canvas boards, ostrich eggs and cloth using various methods. The Zoo’s animal artists include the African painted dogs, Zuri the giraffe, Millie the chimpanzee, the reptiles, Gobi the snow leopard, the ostriches, Japura the Andean bear and Darius the Amur leopard. The animal’s art will be available for purchase at the Zoo. What is the best part about this event? Proceeds from this special event go to support Rolling Hills Zoo’s education programs, conservation efforts, exhibit enhancement and more! Now’s that something worth celebrating!